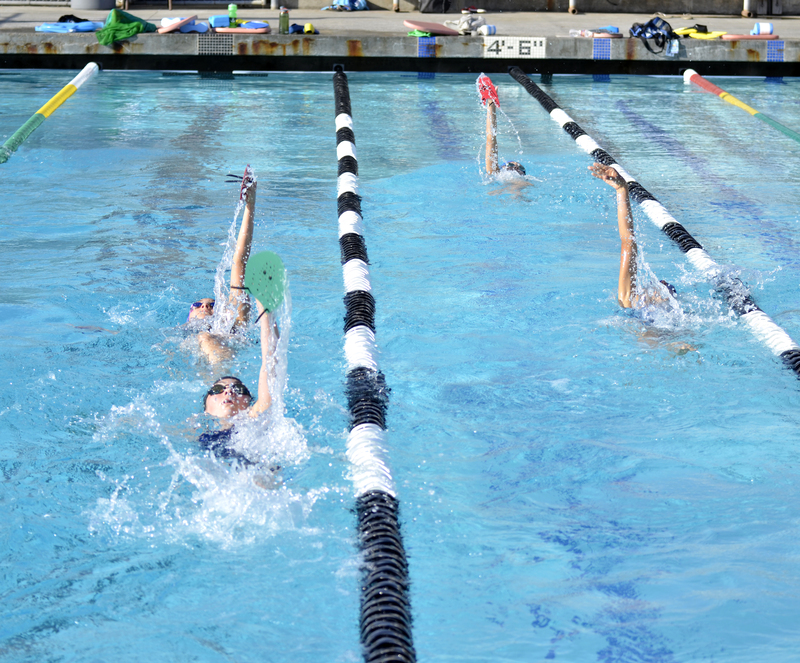 Members of the Malibu Seawolves swim club practice their backstroke on Wednesday, May 21, 2014 at the Malibu High School pool in Malibu, Calif. The Malibu Seawolves swim club could be considered the city’s secret weapon for competitive swimmers. Sporting multiple record-holders from Malibu High, and led by a two-time Olympian, the swim club trains children who have their sights set on improvement in the water. Alexandrov, along with three other coaches, teaches children as young as 5 and helps with developing swimming techniques, body strength and conditioning. Katie Giacobbe, another pack leader for the Seawolves, mentors the younger cubs who are just getting their paws wet. She said she encourages her kids to work hard and learn, but to also have fun in the process. The swim club consists of four groups: Sea Lions, Age Group Development, Age Group Competitive and Senior Development. Each group is designed to progress from the very beginning of swim training to high-level competition preparation. 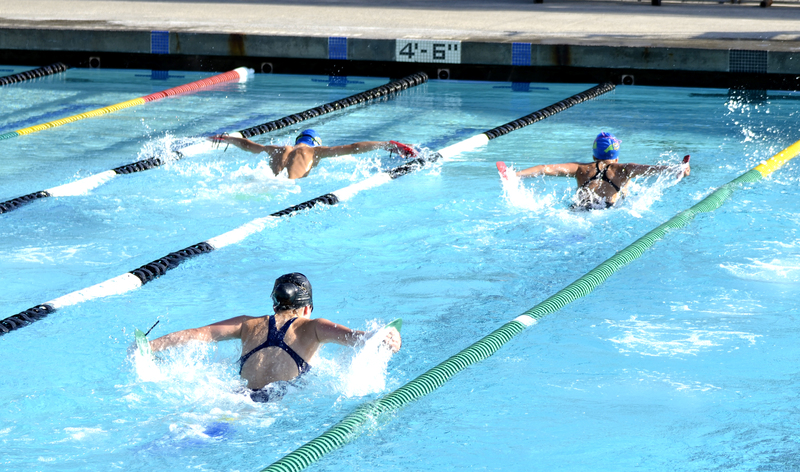 Swimmers are taught everything from the basics of performing the four strokes in swimming — backstroke, butterfly, breaststroke and freestyle — to race strategy and turn execution, according to the club’s website. Nicole Reynaga (left) listens to instructions from Katie Giacobbe about proper push-up technique during a Malibu Seawolves swim club practice on Wednesday, May 21, 2014 at the Malibu High School pool in Malibu, Calif.
Caroline Pietryzk, star swimmer and long-distance track runner for the Malibu Sharks, has been a part of the swim club since fifth grade, back when it was known as Westside Aquatics. Pietryzk said she likes that there are different age ranges on the club team. With Pietrzyk’s sister Kate also on the Seawolves, Pietrzyk gets to experience a bit of sibling rivalry. 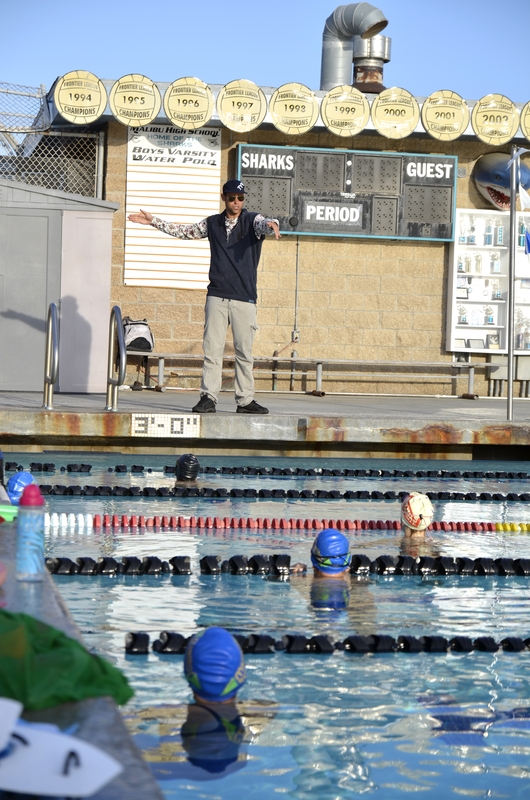 The Malibu Seawolves swim club is only in its second year as a program. After Westside Aquatics left the Malibu area, Alexandrov was brought in to resurrect the program. Alexandrov, a well-decorated professional swimmer who currently holds the American record for the 100-meter breaststroke, is respected by his team. Farah Stack, who recently broke a school record during the Frontier League swimming championships on May 8, feels lucky to be coached by such an accomplished swimmer. Malibu Seawolves head coach Mike Alexandrov gives instructions to his swimmers during a swim club practice on Thursday, May 21, 2014 at the Malibu High School pool in Malibu, Calif.
Stack, a freshman at Malibu High, said she wants to swim in college, and feels like her involvement in the Seawolves is going to get her there. Giacobbe feels her role as a coach for the entire pack of Seawovles is get everyone involved and engaged in the sport of swimming. “I think my goal is just get the kids in my group to really love it and to really enjoy it so that they’ll keep swimming throughout their lives and really love the sport and really make good friends through it,” Giacobbe said. Alexandrov said he gets to see his kids develop into good swimmers over time, and feels proud when he sees them succeed at every level. Members of the Malibu Seawolves swim club practice their butterfly stroke on Wednesday, May 21, 2014 at the Malibu High School pool in Malibu, Calif.
Bill Bixler acknowledges the seniors in his jazz band in between songs during the Malibu Band Concert on Thursday, May 16, 2014 at the Malibu High School auditorium in Malibu, Calif.
On a night where Malibu High School’s winds and jazz musicians took the stage for their annual spring concert, an era was ending. 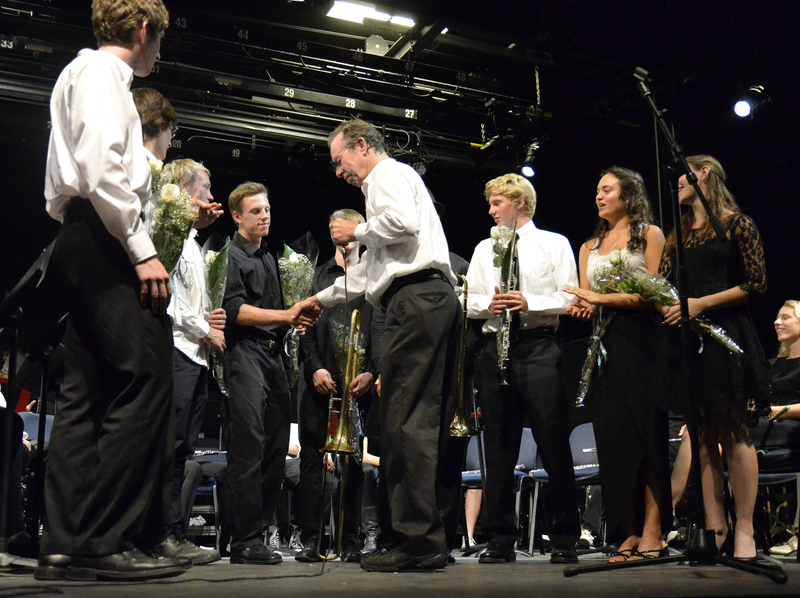 Bill Bixler, teacher of instrumental music, conducted his last concert at the high school on Thursday, May 15. Bixler had taught at the high school for the past 19 years, and said he almost didn’t get the job initially. During a speech after the concert, Bixler’s wife, Leslie Bixler, told the story of how the school lost his application and the position for which he applied had already been filled. But when the position opened up again one week before the school year, Bixler was called in and took the job. Bixler said he had 14 kids to teach when he started in the early 1990s. Since, he has grown the music department and touched the lives of many, including Malibu alumnus Jared Weinstein, who played saxophone at the concert. “It was really nostalgic being back up on stage because I remember doing performance after performance up here with him conducting and him playing along sometimes,” Weinstein said. The spring concert featured music played by Malibu Middle School and the high school jazz and winds bands. Many of the students, including Robben Bixler, had the chance to perform solos with their respective instruments. After the music, Bixler’s wife, son and colleagues gave emotional speeches and shared stories about Bixler’s impact on them and the school as a whole. Bixler was given a bouquet of roses after conducting the last number. As a special tribute to Bixler, lyrics were written to the tune of “Hey Jude” by The Beatles. The song was renamed “Hey Bill,” and sung by the entire audience as Bixler stood listening on the right side of the stage. “And after school has come and gone, you will live on, we cherish the music that you gave us,” said one lyric of the song. Now that he is retired, Bixler said he will reconnect with his wife, tend to his garden, work on his house and visit some of his friends. But while Robben Bixler may be losing a teacher to retirement, he is not losing the man he considers his best friend since fifth grade. 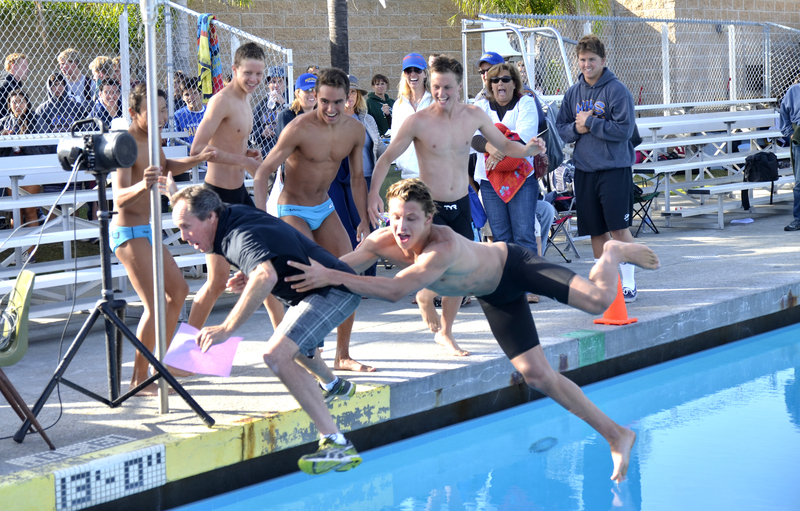 Members of the Malibu boys swim team pull head coach Mike Mulligan into the pool after he announced the team’s second straight league championship on May 8, 2014 at Malibu High School in Malibu, Calif.
As Malibu High School boys swimming head coach Mike Mulligan announced the results of the Frontier League Championships on Thursday, May 8, his swimmers waited. Third place went to Grace Brethren and second to Nordhoff. Then Mulligan said the words everyone was hoping to hear. “First place, Malibu,” he said. That was the cue for the boys to grab their coach and fling him into the pool. The Sharks were the champions again. Malibu won a total of 26 races and earned 11 automatic CIF bids on the road to their second-straight league championship. Mulligan did not mind getting thrown in the pool, as long as it came in victory. 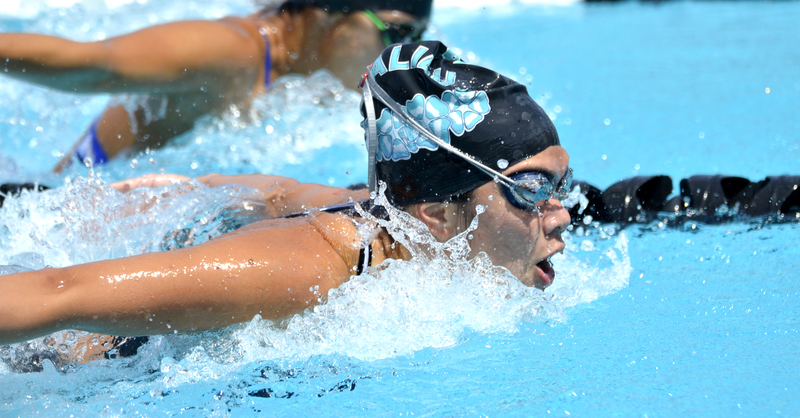 Malibu junior Amber Veronique does a butterfly stroke during the Frontier League Swimming Championships on Thursday, May 8, 2014 at Malibu High School in Malibu, Calif.
Mulligan said this was the first time in his 20 years of coaching that the Sharks won two straight titles. Girls head coach Tim Segesman said winning two years in a row is a difficult achievement. The Sharks started the meet off strong, coming away with first-place times in the first two events. That set the tone for a day full of dominating wins for Malibu. Freshman Farah Stack won both of her events. The first was the 200-yard freestyle, where she finished with a time of 1 minute, 58.57 seconds. That time was more than enough to earn her an automatic CIF bid. In the 100-yard backstroke, Stack finished with a time of 1:1.37, also earning her an automatic bid to the CIF playoffs. 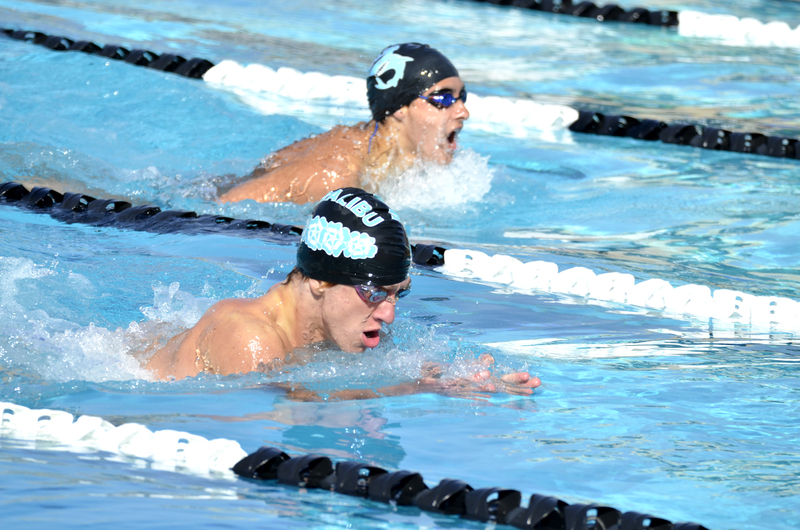 Malibu freshman Tommy Gibson (bottom) and sophomore Luke Appel swim the breast stroke during the Frontier League Swimming Championship on Thursday, May 8, 2014 at Maliu High School in Malibu, Calif.
After the meet, Stack could hardly believe her ears when her coaches told her she had broken the school record in the backstroke event. When reality set in, tears filled her eyes as her teammates hugged and congratulated her. Segesman said Stack has the potential to keep breaking records. The 100-yard freestyle went down to the wire. 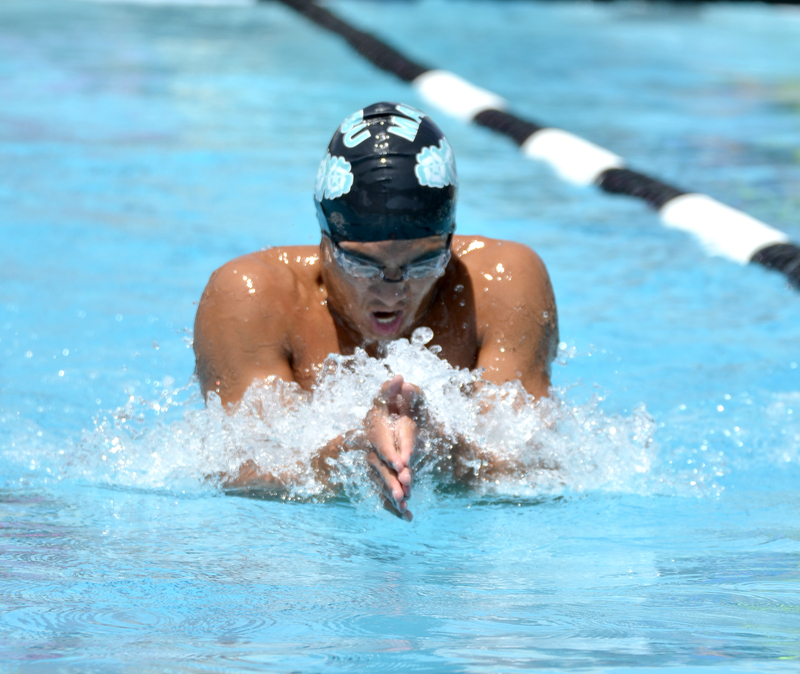 Junior Franz Owen narrowly eked out a win over Saint Bonaventure senior Patrick Wilbur with a time of 48 seconds. Wilbur’s time was 48.26 seconds. Malibu junior Logan Hotchkiss also squeezed out a close victory in the 100-yard breaststroke, winning the race by less than one second. His time of 1:02.93 earned Hotchkiss an automatic CIF bid. Mulligan attributes this year’s championship to the strength and talent of his team. Malibu senior Jens Cole swims a breast stroke Malibu junior Amber Veronique during the Frontier League Swimming Championships on Thursday, May 8, 2014 at Malibu High School in Malibu, Calif.
Cooper Barton jumps the high jump event on Wednesday, April 30, at the Malibu High School track and field meet. Records were meant to be broken. The daughter of Malibu High School high jump coach Anthony Shafer, Kayleigh, held the record for high jump height for 15 years. But on Wednesday, April 30, junior Michaela Cosentino jumped 5 feet, cementing her name in the record books. Kayleigh Shafer held five records at the high school over the years, her father said. But Anthony Shafer was glad it was Cosentino who set the mark. Malibu shined overall in the jumping events on April 30, taking home several first places. In the boys high jump, seniors Dyer Pettijohn and Linus Gordon both jumped 5 feet, 10 inches, giving them first and second place, respectively. Pettijohn and Gordon also took first and second in the long jump. Dyer narrowly edged Gordon by half an inch in the event. In the triple jump, Pettijohn flew for a first-place jump of 37-07.00, while Gordon jumped 38-11.00, earning him second place. Anthony Shafer likes the way the seniors can feed off each other during events. Caitlin Myers (left) paces herself against a runner from Santa Paula. Anthony Shafer also likes the jumping talent he sees on the Sharks’ team this year. 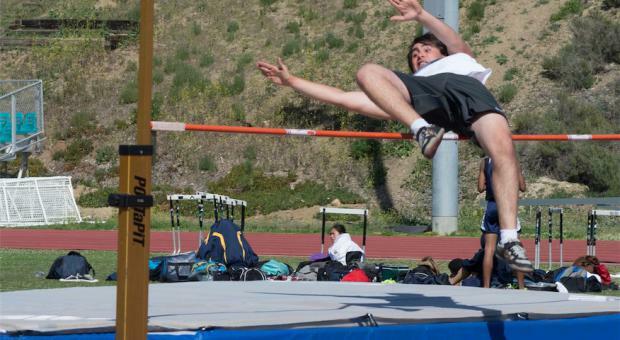 Anthony Shafer also made a point to single out the Malibu high-jumping team. Malibu struggled in most of the running events, but was able to come away with a couple of victories. Cosentino took first place in the 100-meter hurdles with a time of 16.73 seconds. Junior Caroline Pietrzyk continued her dominance in the 3,200-meter run with a time of 12:23.23, almost a full minute faster than the second-place finisher from Santa Paula, Ashley Valdovinos. Freshman Abby Blackwood tried her hand at the 800-meter run for the first time, and nearly won. 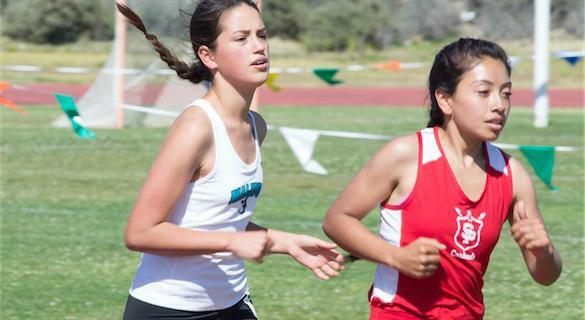 She had the lead for most of the race, but was eclipsed down the stretch by Grace Brethren freshman Patricia Ramirez. “I would have kept going, but one of the girls from the team told me to slow down because she didn’t want me to waste my energy,” Blackwood said after the race. “It was good. I’m glad she told me to do that, because I think I would have burned myself out. Blackwood finished with a time of 2:36:81. She said she would probably do the event a couple of more times. The meet’s athletes had to contend with high winds for most of the day. Head coach John Cary said it was the windiest meet he has seen in the past five or six years, and that it could have affected the performance of the runners. The Malibu track team competed in league finals on Friday, May 2, at Santa Paula High School. 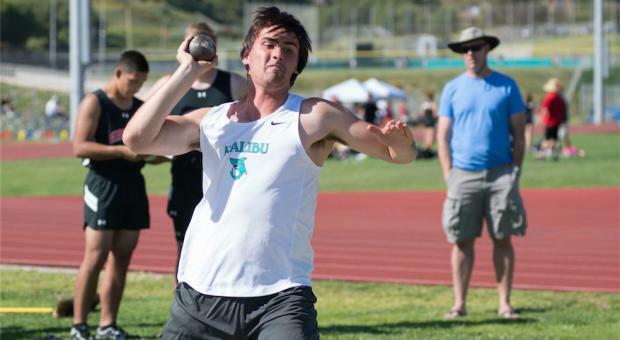 Cooper Barton throws varsity shot put for Malibu.